Dissociative Recombination of Molecular Ions with Electrons is a comprehensive collection of refereed papers describing the latest developments in dissociative recombination research. The papers are written by the leading researchers in the field. The topics covered include the use of microwave afterglows, merged beams and storage rings to measure rate coefficients and to identify the products and their yields. The molecules studied range in size from the smallest, H2+, to bovine insulin ions. The theoretical papers cover the important role of Rydberg states and the use of wave packets and quantum defect theory to deduce cross sections, rate constants and quantum yields. Several theoretical and experimental papers address the controversial topic of H3+ dissociative recombination and its importance in the interstellar medium. Dissociative recombination studies of other molecular ions in the interstellar medium and in cometary and planetary atmospheres are covered. Ionization is an important competitive process to dissociative recombination and its competition with predissociation and its role in the reverse process of the association of neutral species is presented. Dissociative attachment, in which an electron attaches to a neutral molecule, has many similarities to dissociative recombination. 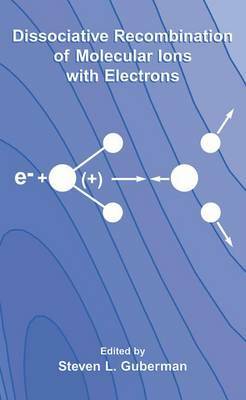 The topics covered include the accurate calculation of electron affinities, attachment to molecules, clusters, and to species absorbed on solid surfaces and electron scattering by a molecular anion.